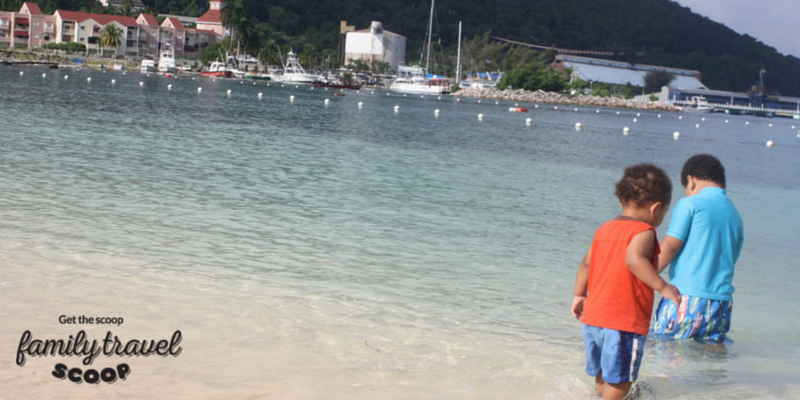 The beach is always going to be one of the top things to do in Ocho Rios with kids. Silky white sand and beautiful waters to cool off in make Ocho Rios, Jamaica a great choice for families. There are always lots of Ocho Rios activities available from jet skiing, banana boats and snorkeling. Don't forget to build sandcastles and hunt for shells. Dolphin Cove has a variety of activities for the whole family. Kids are fascinated the dolphin encounter or dolphin swim. Children should be at least 8 years old and accompanied by a paying adult. Entrance to the park includes sting ray interactions (barbs removed), glass bottom kayaks, mini boats, dolphin shows and a jungle walk. 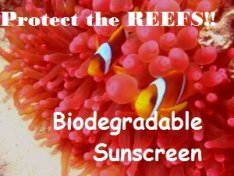 There is also a half or full day Sea Keeper program for children who are 10 or older. This is one of the best things to do in Ocho Rios with your kids if they are animal lovers. We lived in Jamaica for several years and this was a favorite of my kids! 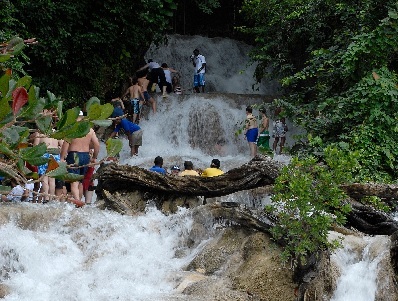 No vacation in Ocho Rios is complete without a trip to the world famous Dunn's Rivers Falls . Older kids are entralled climbing up the falls and swimming in the cool pools of water along the way. There is a beach at the bottom to enjoy as well. Make sure to bring your water shoes. The handicraft vendors are quite aggressive here so be prepared to bargain hard if you want to shop. Head to Turtle River Park in town where the kids can check out the fish pond and search for turtles. play on the playground or relax in the gazebo. You will have lots of of offers to have the kids hair braided with colorful beads. Do a test braid first to make sure your kids can handle it as it may be a bit painful if they are not used to it. Visit one of the many Handicraft Markets for some shopping. Have the kids test their bargaining skills for a souvenir to bring home. Pick out a straw bag, Jamaican bag or a Reggae CD. The market vendors can be quite aggressive especially at Dunn's River Falls. Stroll the beautiful Coyaba Gardens. 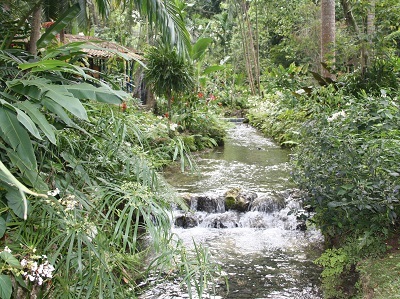 Get a guided tour and learn about the plants that are native to Jamaica, cool off in the waterfall and taste some of the spices that grow here! Spend a few hours at Mystic Mountain where you can take the sky lift explorer up above the rain forest. The kids will be thrilled with the 1000m bobsled ride back down. Ziplining is available for kids 12 and older. There is also a small infinity pool and water slide to enjoy. One of the most unique Ocho Rios activities for your family. Check out Island Village for some duty free shopping or let the kids pick out a souvenir here! Grab a burger at Margueritaville or ice cream next door. Lots to shop for here! Eat, eat & eat! Jamaican food is delicious-you don't want to miss out on a freshly baked Juicy beef patty, jerk chicken from the roadside vendor or a mango plucked right off the tree!! Here are some of the best Jamaican dishes for your family to sample! Take a Zipline tour through the jungles of Jamaica. There are two companies offering this exciting adventure. Chukka tours and Zipline Adventure both require children to be at least 10 to participate. Teenagers usually are thrilled by a trip to Nine Mile to see the birth place of Bob Marley. Take a tour of this peaceful village where many of the King of Reggae's songs were written and visit his mausoleum. This is a must do for reggae lovers. Luminous Lagoon is a must do and located only 50 minutes drive from Ocho Rios. Kids will be thoroughly impressed with Mother Nature when they see the water glow in the dark. Take a boat ride to see the full effect of the microscopic organisms, living in the lagoon, that emit a phosphorescent light when the water is agitated. 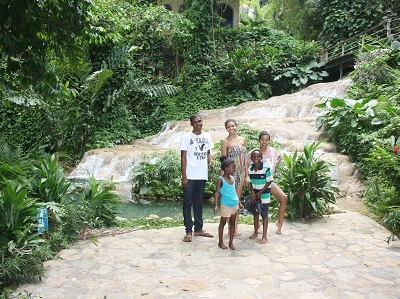 Another one of the unique things to do in Ocho Rios with your family. So what did you think about our top things to do in Ocho Rios? The best Ocho Rios family hotels! 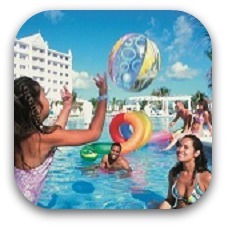 All Inclusive family resorts in Ocho Rios! Yummy Jamaican food your family will love! 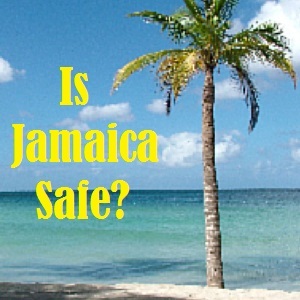 Is it safe to travel to Jamaica with your family?